On July 14th 2015, millions of two-legged mammals watched with bated breath as a piano-sized spacecraft of their own making pulled up to an icy rock three billion miles away. 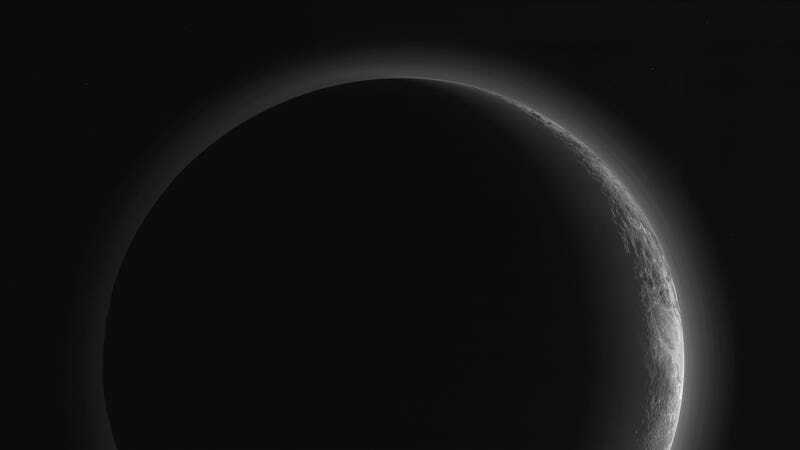 Through the eyes of New Horizons, we got our first good look at Pluto, and what we saw astonished us. But eight months on and several beefy scientific papers later, it’s clear we’ve barely scratched the surface of this tiny world’s complexity. We’ve seen towering mountains of frozen water. Canyons carved by flowing nitrogen. Hills of ice floating atop patterned plains of ice spread across a global ocean of ice. A sky that catches the light and scatters it, creating dozens of intricate layers. (That sky turned out to be blue.) Tiny moons thatspin like frantic tops. A binary doppelganger called Charon. A system far more complex and dynamic than anything planetary scientists dreamed of finding in the dark outer reaches of our Solar System. Five new studies, all published today in Science, are beginning to tell the story of Pluto and its family of strange little moons. But while the facts, figures and images contained in these papers are impressive, our understanding of it all is still very limited. As the half-dozen planetary scientists I spoke to for this article told me, we still have everything to learn about what makes this cosmic wonderland tick. In brief, here is what we do know. Pluto is a small planet—70 percent the diameter of our moon—locked in a gravitational embrace with Charon, a moon about half its size and an eighth its mass. It’s got a large, rocky core, with a similar elemental composition to the Earth. That core is wrapped in a mantle of water ice, which in turn is coated with a layer of more volatile ices, including nitrogen, methane, and carbon monoxide. At temperatures ranging from Hell-frozen-over to Mars-never-looked-so-beautiful, each of these three volatile ices is sublimating, precipitating, and flowing across Pluto’s surface. The result is an astonishing variety of landscapes ranging from patterned plains to ancient, rugged craters to towering mountains and perhaps even ice volcanoes. Among the most interesting and mysterious geologic features is Sputnik Planum, a 1000 kilometer-wide, crater-free basin of ice located in the western lobe of Tombaugh Regio, better known as Pluto’s “heart.” Distinguished by its blocky, polygonal structure, Sputnik Planum appears to be actively evolving: as Will Grundy of the Lowell Observatory put it, “it’s slowly overturning like a rumbling pot of oatmeal.” The mechanisms behind this icy convection are not known, but it’s probably due to a combination of heat from Pluto’s interior and density differences between nitrogen ice on top and water ice below. Things get no less messy when we ascend into Pluto’s atmosphere, a ~1500 kilometer-high bubble of nitrogen and methane. 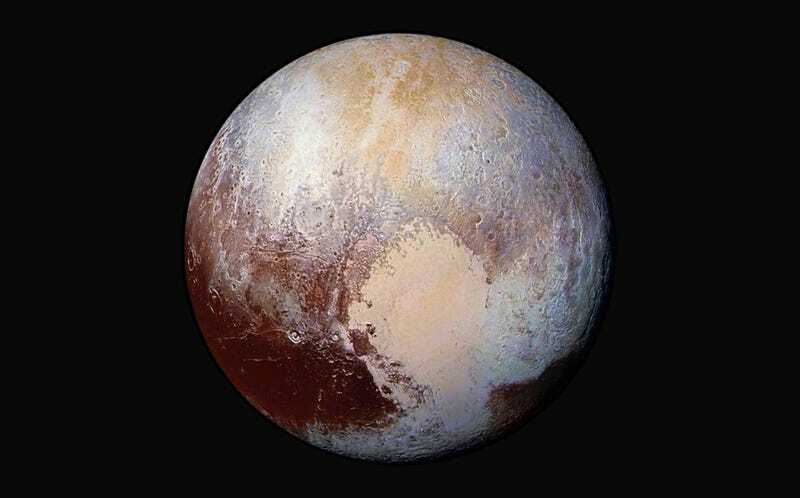 Thanks to some complex photochemistry that starts with methane being struck by UV light, Pluto’s atmosphere also contains a smattering of heavier organic compounds, including acetylene, ethylene, and ethane. These molecules end up forming reddish soot-like particles, called tholins. And as tholins are struck by the dim sunlight, they produce haze. Lots and lots and lots of haze. 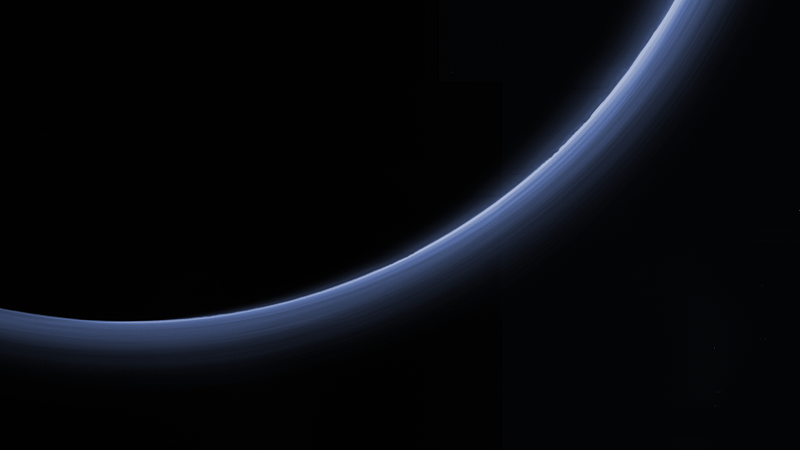 Indeed there are dozens of distinct haze layers in the first 200 to 300 kilometers of Pluto’s atmosphere, and they’re absolutely breathtaking. But how exactly are they being formed? In his paper, Gladstone and his co-authors propose that the hazes are produced by gravity waves—notgravitational waves, but buoyancy waves in Pluto’s atmosphere, which keep the tholin particles suspended at distinct horizontal layers. More research will be needed to test that hypothesis. Another big surprise from the New Horizons flyby: the upper atmosphere is much colder and denser than we expected. In fact, it gets so cold at very high altitudes that nitrogen gas begins to settle out, leaving a thin veneer of methane brushing against the edge of space. Pluto’s space environment is also remarkably clean. “We were thinking with four small moons plus Charon, there’d be a lot of debris,” Bagenal said. But New Horizon’s dust counter found few stray particles during its speedy pass through the system. “I think what this tells us is any dust created by the formation of the moons has since dissipated,” Bagenal added. That, in turn, tells us that the epic impact that created Pluto, Charon, and their four small satellites, took place long, long ago. To learn more about this violent history, a final Science paper examined those satellites in more detail. Nix, Styx, Kerberos and Hydra are the tiny (>50 km across) and shiny moons orbiting the Pluto-Charon binary system. “The moons have a decent number of craters, which push their formation to at least four billion years back,” Bill McKinnon, a co-author on the baby moon study, told Gizmodo. Although the composition of the moons hasn’t been determined, they’re bright enough that we can be certain they’re made of ice. Probably, they are chunks of Pluto’s outer shell that got ripped off during the Big Smackdown. There’s no nice way to say it: Pluto’s little moons are completely whack.They’re rotating way faster than they should be and at crazy angles, like dice in a pop-o-matic strapped to a Tilt-A-Whirl. We have no idea why. All five of the papers published today give us observations, of which I’ve breezed through here. Together, they represent an impressive synthesis of months worth of data that’s been downlinked from New Horizons over the Deep Space Network. It’s incredible to think that over half the data from the Pluto flyby is still on a spacecraft sailing deeper and deeper into the Kuiper Belt, and that we won’t have it all back for another eight months. The data to come won’t change the story much, but it will help flesh out the details. The next big step for the New Horizon science team is to look beyond the what and start asking why. Because as I said at the outset, despite all the observations we’ve made about Pluto, we understand very little. 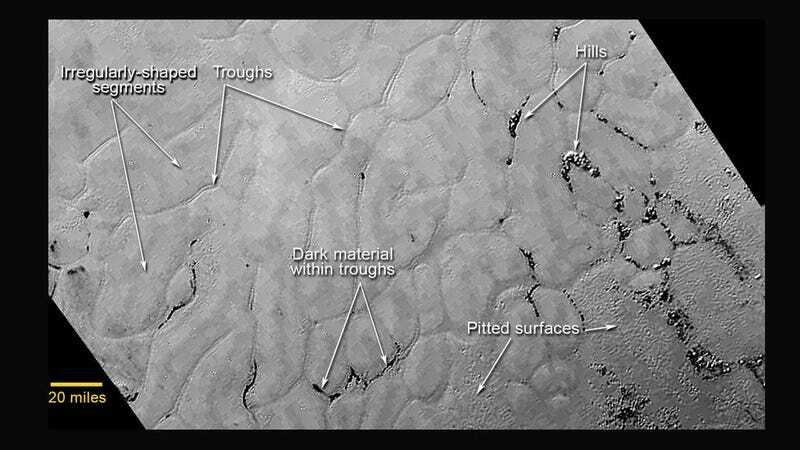 Exactly how were Pluto’s mountains and badlands and valleys created, and how quickly are they evolving? What processes are reshaping Pluto’s surface—is it all just a matter of sunlight sublimating ice, or does heat from the interior play a role? Why is Pluto so good at retaining its atmosphere, and how does that atmosphere interact with the ground? What did Pluto and Charon look like in the past, and how have they changed? We’re just now beginning to answer these questions, but that’s okay. In fact, it’s better than okay. It means the best discoveries are still ahead of us.